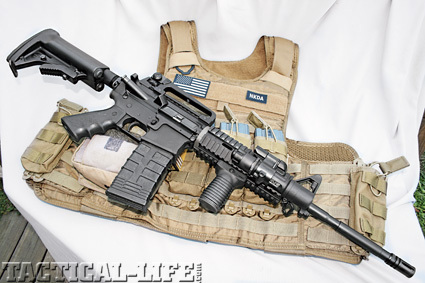 The 5.56mm Hybrid M4 carbine built with C3 Defense lower, DPMS upper receiver and Choate stock. One of the most interesting and gratifying phenomenons I have seen during the recent uptick in firearms ownership is the rise of the workbench custom AR. The Stoner-based rifle platform is infinitely modifiable and upgrades or additions are relatively simple to install. Naturally, every firearm is made of “parts” or components that are carefully assembled in the factory. Certain items require meticulous manufacturing. The barrel comes instantly to mind followed by the upper and lower receivers. For this project I wanted to assemble my very own custom M4 using parts from a number of reputable manufacturers. AR style rifles are composed of myriad parts, but the component that is actually classified as a “firearm” is the lower receiver. The lower receiver, minus springs, trigger, stock, etc. is the serialized component and the one part that must be transferred through a registered FFL holder. For this project I would secure a stripped lower receiver from C3 Defense. At first glance it was obvious that this part was well made. The lower receiver is machined from a solid billet for strength, giving the receiver a symmetrical, squared shape. C3 has included some special features on their lowers. For instance, there is a tension adjustment screw at the base just below the buffer tube. This allows the end user to reduce/eliminate the “play” normally found between the upper and lower receiver. The magazine well is flared to ease loading and they have textured the front grip where many shooters like to hold the rifle. C3 Defense solid billet lower receiver. This particular receiver is standard black but they also make them in OD Green, Natural Earth (tan) and Dark Earth (coyote). C3 markets receiver sets with matching uppers and lowers both stripped and the same color. If you’d rather just purchase the entire gun they have complete rifles as well. For the upper receiver I would use a completed receiver assembly from DPMS. This particular unit was their AP4 assembly. The unit included a 16-inch barrel with NATO spec flash suppressor. A genuine 5.56x45mm chamber was used and the rifling is 1-in-9-inch right-hand twist. Barrel material is 4140 chrome-moly steel. The receiver is a flattop design with an A3 carrying handle. 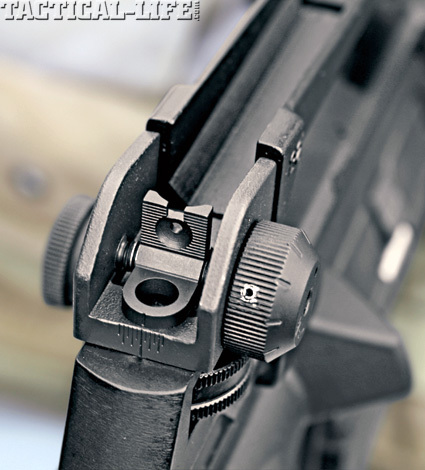 A forged “A-frame” front sight housing can be adjusted for elevation and a fully adjustable A2 rear sight allows for windage and long distance elevation. In place of the Panther Arms GlacierGuards that were shipped with the upper assembly I ordered a six-rail solid aluminum forend also from DPMS. This would allow me to install the accessories I desired up front. The upper assembly included all the internal parts; bolt and bolt carrier, charging handle, forward assist, barrel nut, gas tube, etc. It arrived ready to mate with a lower. Speaking of the lower, as I mentioned it was a “stripped” model. No trigger, springs, pins, or other parts. bolt catch and pistol grip. Aside from the A2 pistol grip all these items would go into the gun. One of the last big pieces of the puzzle was the stock, buffer, and buffer tube. Several years ago I tested out a new telescoping buttstock from Choate Machine & Tool. I was impressed by the rock solid, rhino-tough construction and when I was putting this piece together I decided to have another look. Since my initial introduction, Choate has made a few improvements to the stock. They trimmed it a bit to shave off some weight but it is still rock solid. Battery storage compartments are found on both sides of it. The stock has five-separate telescoping positions and a deep-checkered rubber buttplate. As I required all the stock parts I ordered Choate’s stock/buffer/spring kit. If you already have a tube and simply want to switch stocks you can purchase that piece separately. The tube is aluminum and the stock is high-impact polymer. While I was at it, I ordered a single-point sling adapter from Choate as well. CSAT rear aperture made by XS Sights. The Brownells DVD made assembling the rifle a simple, enjoyable task. 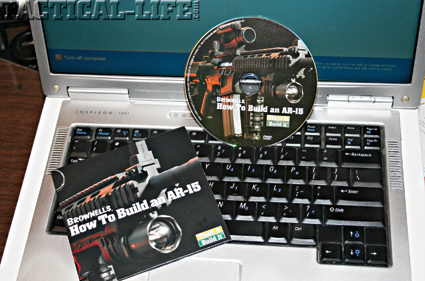 One of the greatest discoveries I made this last year was the How to Build an AR-15 instructional DVD. Brownells master gunsmith takes you step-by-step through the complete assembly of the Stoner-style rifle. The magic of the DVD format is the “Chapters” menu that lets you pick exactly where you want to go. Of course you can pause the DVD right in the spot you need view. Naturally, Brownells offers all of the tools and accessories you would need to assemble an AR. They even have a tremendously helpful website with online video clips. Go to the GunTech section and you will soon be itching to build your own rifle. On a quick personal note, Brownells is a true American Success story. The business began in a spare room with two employees, husband and wife. Today the third generation of the Brownell family is running the business in the Iowa community where they began: with 100+ employees. Following the directions on the Brownells DVD I was able to completely assemble the rifle at the kitchen table using a variety of hand tools. You’ll need a punch kit, mallet, and screwdriver set. The only true specialty tool you will need is an M4 wrench to tighten the buffer tube nut. Gladius Maximus light attached to 6-way rail with Safariland RLS mount. Installing the aluminum forend would require the removal of the front sight housing so I sought assistance from a qualified gunsmith. My guy at Cook’s Gun Shop in Biloxi, Mississippi had the forend installed the day after I dropped it off. In addition to the aforementioned items, I added a few other special touches. 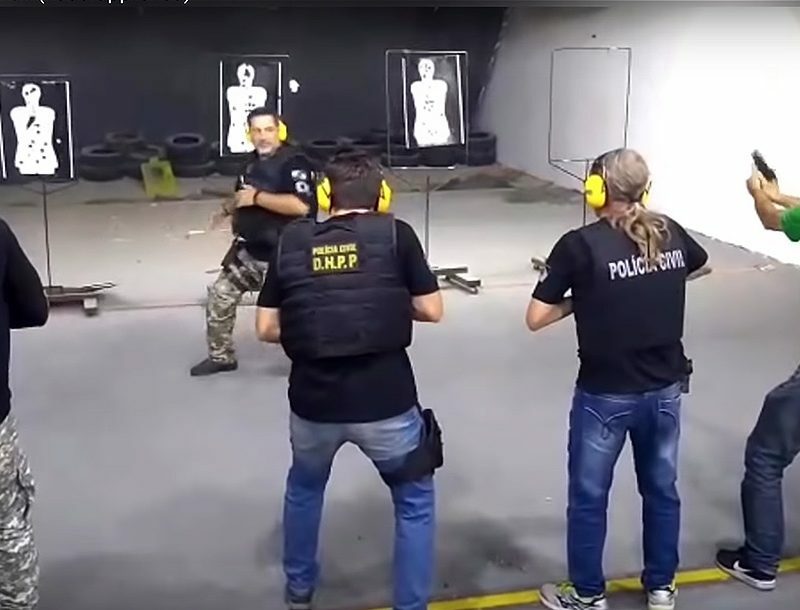 The stock sights were one area for improvement. While completely functional, there are better parts. The front sight post was replaced with an XS Sights Tritium front sight blade. The standard A2 rear sight aperture was replaced by the new CSAT (Combat Shooting And Tactics) aperture from XS Sights. The CSAT rear sight combines a square notch for close in shooting and a peep sight for distance work. 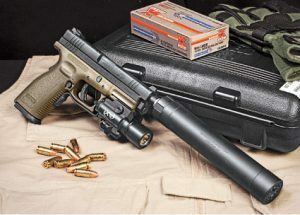 When shooting up close, inside 25 yards, the shooter simply puts the front sight in the notch like they would a pistol. When a more precise or distant shot is needed you can use the peep aperture. The CSAT sight also compensates for the 2.5-inch sight offset on the AR/M4 rifle. I picked up a Hogue AR pistol grip at a gun show and used it instead of the standard A2 design. It feels good in my hand, so why not? Up front under the rail system I installed a new stubby vertical foregrip from TAPCO. This is one of my new favorite items from them. The stubby version gives you the grip you desire without taking up too much space. 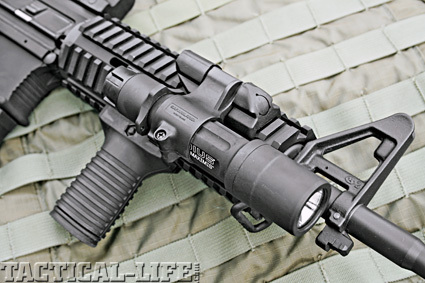 The use of the stubby foregrip allowed me to make use of a tactical light configuration. I mounted a BlackHawk Gladius light to the forend with a Safariland RLS mounting bracket. The blindingly brilliant white LED light of the Gladius Maximus puts our 120 lumens and activates with a tailcap switch. For my range sessions I would feed the beast with 30-shot magazines from Brownells and TAPCO. The Brownells magazines are Mil-Spec. I’ve been working with the new TAPCO versions for a few months now and they’ve been totally reliable to this point. Fodder for the review took the form of 5.56x45mm ammo from Summit Ammunition and ATI (American Tactical Imports). The Summit load was 55-grain FMJBT (M193) and the ATI was 62-grain FMJ. This is basically equivalent the military’s SS-109 load. Summit ammo is made in the USA and the ATI load is an import from Turkey. Prior to sitting down to type this review I took the gun to the range on three separate occasions. In addition to accuracy testing and chronographing, I ran it hot, conducting numerous drills. I found the more I shot the gun the more I liked it. 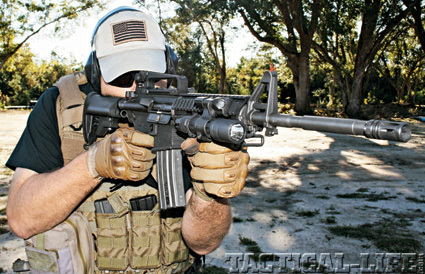 The carbine has plenty of mass to tame the recoil of the 5.56mm loads. Rapid target engagement was no problem. The bolt and bolt carrier were given a generous coating of Friction Defense lube, available from Brownells, prior to each session. Dry guns don’t run. Keep you black rifle lubed and it will give you excellent service. 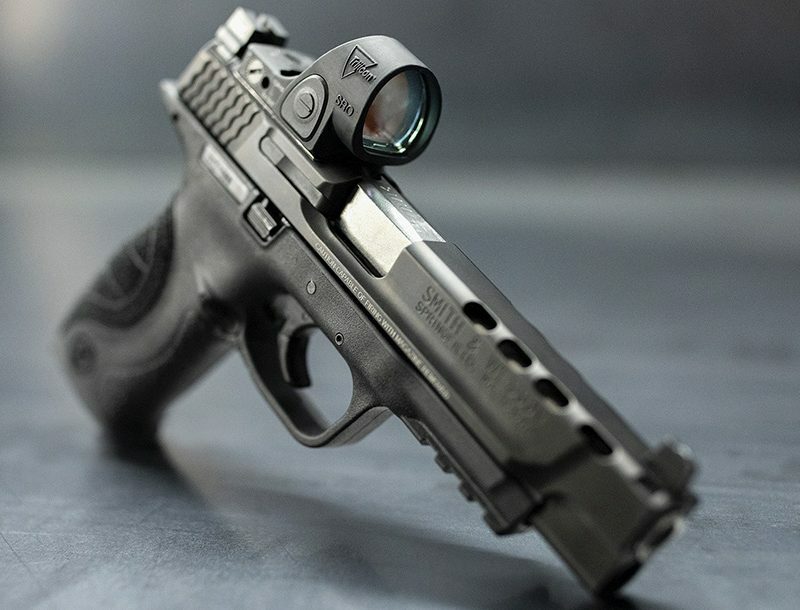 Regarding the XS front and rear sights, I really grew to appreciate them during moving and shooting drills and while shooting at unconventional targets, such as the 3D “Tactical Ted”. The Tritium front sight works in all light conditions and the CSAT aperture allows you to get on target rapidly during CQB shooting. During the work up I carried spare ammunition in pouches on my BlackHawk STRIKE Armor Carrier. 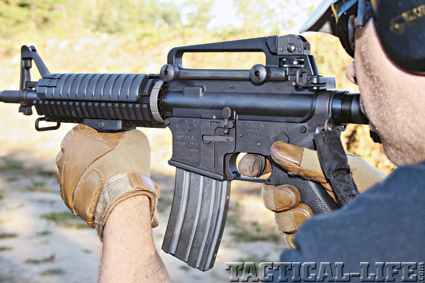 Black rifles get hot and it is best to protect your hands. I’ve used the Nomex SOLAG gloves from BlackHawk for better than a year now and they are my favorite gloves from that company. The gloves are soft and pliable enough to operate any firearm while at the same time providing excellent protection for your mitts. 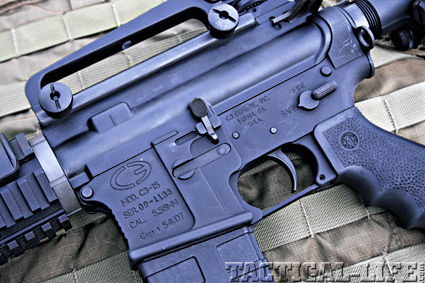 The author found the Hybrid 5.56mm 100 percent reliable and quick on targets. During this entire process, from the selection of the parts and components to the assembly and finally on to testing, I was able to participate in an enterprise unavailable to the majority of this world’s population. Consider that for a moment. Here in these United States a citizen, a free man, can purchase, assemble and possess a rifle that is prohibited to the vast majority of the world’s populace. Most of the human beings inhabiting this planet are not truly citizens but are completely subject to the government of their nation. When a man cannot possess arms for his own defense he is not free, but rather reliant upon the whim of others to protect him, he is subject to another’s will. Building this gun with the excellent parts from C3 Defense, DPMS, Choate and all the others was a truly gratifying experience. If you have the means and inclination to undertake such an enterprise I wholeheartedly recommend it.